Old Radnor Barn Bed & Breakfast01874 712102work Guest AccommodationSituated on the outskirts of Talgarth (6.5 miles from Brecon) Powys within the Brecon Beacons National Park, Old Radnor Barn offers charming 4 star Bed & Breakfast accommodation with three bedrooms in a 16th century converted stone barn. Not so long ago stallions travelling to stud on the Great Western Railway rested in the barn overnight, on their journey through Mid Wales. The railway has gone but the small market town of Talgarth still nestles peacefully in the foot-hills of the Black Mountains. Set within the Brecon Beacons National park, the area is renowned for its scenic beauty and is an ideal base for activity holidays, including opportunities for walking, climbing, pot-holing, pony trekking, mountain-biking and gliding together with a full range of adventure water sports. In addition, the rivers Wye and Usk boast some of the best trout, salmon and course fishing water in Wales. The magical and tranquil Llangorse Lake lies three miles to the west. For those of you who prefer to take life at a gentler pace, perhaps a visit to Offas Dyke or one of the many castles of Mid Wales and the borders. If you are interested in a more recent history, then why not visit Merthyr Tydfil or Blaenavon and its recently awarded world heritage status. We are situated mid-way between the historic cathedral town of Brecon with its new theatre and canal-side attractions and Hay-on-Wye, the border town internationally renowned for its second-hand book shops. We are delighted to offer ground floor accommodation with level access, suitable for elderly or disabled guests. All our rooms which consist of 1 Family, 1 twin/kingsize and 2 doubles, all have en-suite or private bathrooms. Full breakfast menu available, including options for vegetarians and people with special diets. Our speciality is our traditional Welsh breakfast. When ever possible we use our home grown/home made produce. Our meats, come from Cashells of Crickhowell and is sourced from local farms. Evening meals, light suppers and packed lunches are available on request. 2 nights: Sunday-Thursday £140 B&B. *Excludes Feb H/Term & Easter holidays. *Based on a double room with two people sharing. 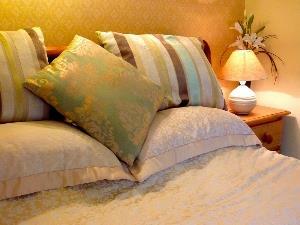 3 nights Sunday-Thurs £210 B&B *Excludes Feb H/Term & Easter holidays. *Based on a double room with two people sharing.